Dr. Khan and his team at Three Rivers Oral and Maxillofacial Surgery are excellent with children and are dedicated to providing a safe and comfortable environment for them. 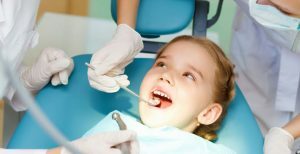 Many adults have dental anxiety and fear, and children are no different, with many having irrational fears when it comes to dentists, needles, sharp tools and the word “surgery” in general. Sedation is recommended under several circumstances. Firstly, young children are often unable to stay still for long enough for the oral surgeon to perform complex procedures safely. Sedation makes the visit less stressful for both children and adults and vastly reduces pain. Secondly, some children struggle to manage anxiety during medical visits. Sedation helps them to relax, cope, and feel more comfortable about treatment. Thirdly, sedation is particularly useful for children with special needs. It prevents spontaneous movement, and ensures cooperative behavior. Dr. Khan recommends extractions for children being conducted under IV sedation, in order to minimize pain, trauma and to increase comfort. Contrary to public belief, IV sedation for children is completely safe, as we constantly monitor vitals and ensure the least possible pain for our patients, small and big.